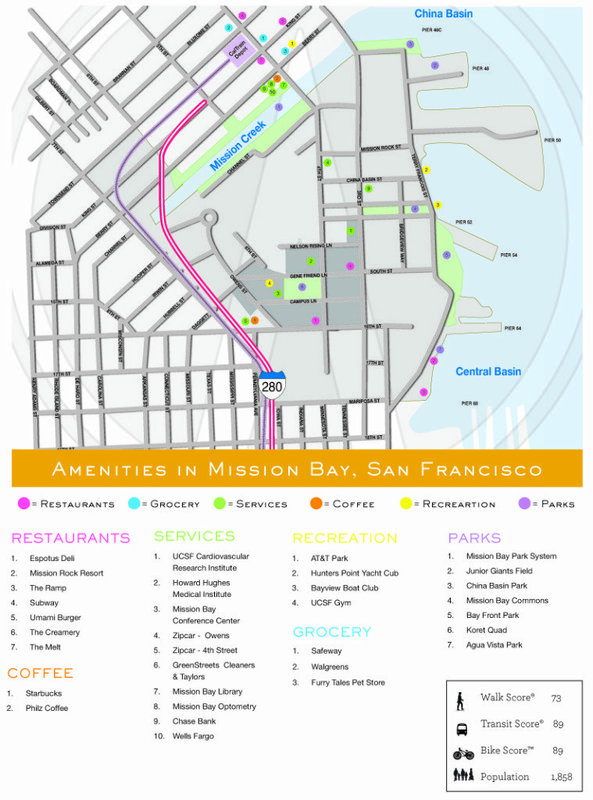 There are a number of new developments in San Francisco that are being planned, in progress, and selling out as we speak. Here’s a selection of projects around the city to give you an idea of recent changes, ones that are currently happening, and ones that are just around the corner. Status: In planning, approved, about to break ground, breaking ground. Status: Under Construction, almost complete, pre-sales. Status: Selling, almost sold-out, sold-out. It is far too early in the year to reach definitive conclusions regarding substantive changes in the market, but there are indications of a number of shifts. From the hurly burly on the street, the word is that the quantity of offers coming in on new listings is declining. 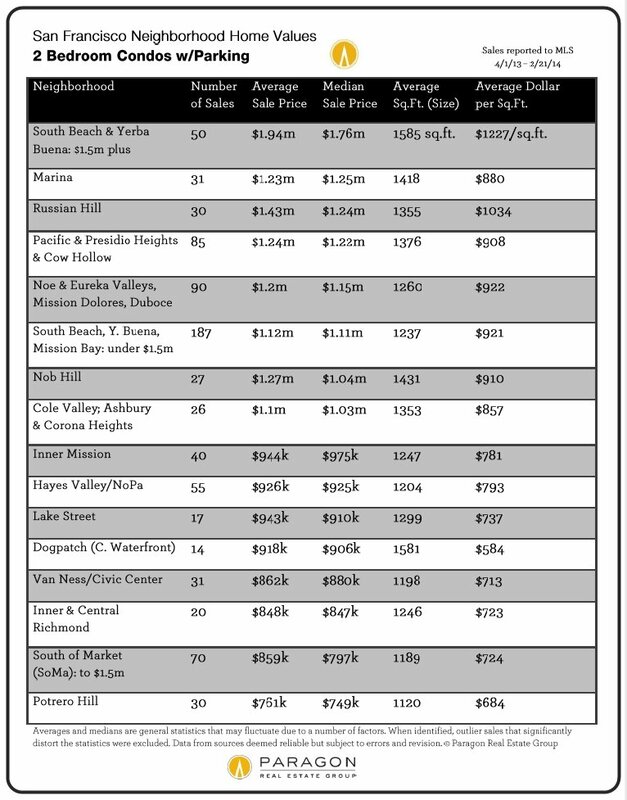 Where a new listing might have attracted 10 or 12 offers last spring, 3 or 4 are coming in now; where 3 or 4 offers would have arrived, the seller is getting 1. And, according to Broker Metrics, for every 2 listings that accepted offers in December and January, another listing expired or was withdrawn without selling. 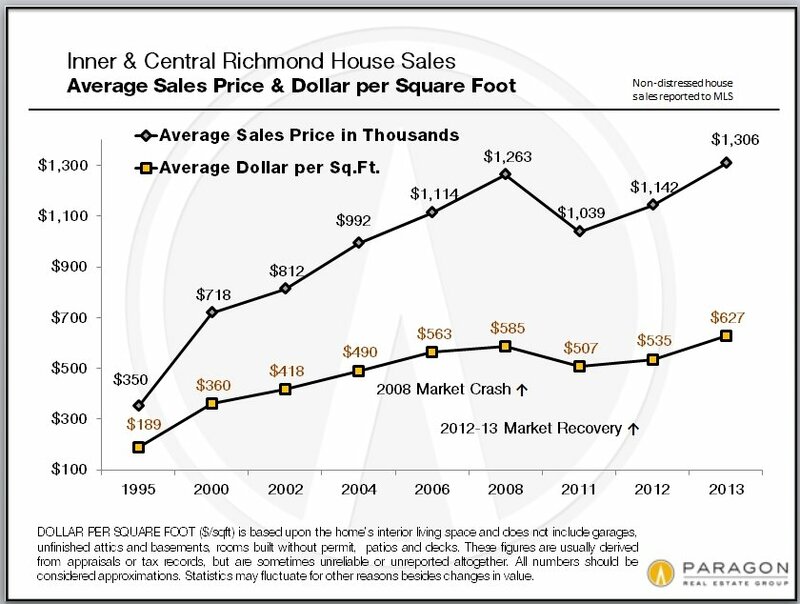 The amount of competition deeply affects home price increases. There are still a very large number of buyers looking at listings online and at open houses. But more of them appear to be first-time buyers and they are proceeding more cautiously. Some buyers are burned out on the multiple-offer bidding frenzies of last year and are reluctant to participate in them. Though the market remains hot by any reasonable standard, by some statistical measures it is cooling. This may reflect a transition or only a lull before the spring sales season begins. Recently, the investment-property analysis firm Reis speculated that SF apartment-rent growth — which has been extraordinary by any measure, especially in a period of low inflation — will slow despite intense demand and very low vacancy rates, simply because people can’t pay any more. It’s an idea which may or may not be correct or apply to other types of housing costs. Rent rates do play a role in purchase prices as buyers often compare the net housing costs of the two options. 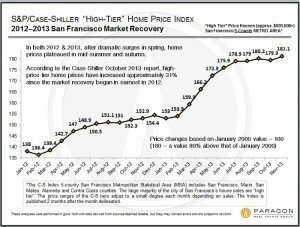 In San Francisco, some of the most affluent neighborhoods — such as the Pacific Heights-Marina district and the Noe, Eureka and Cole Valleys district — started their recoveries in the second half of 2011, well before virtually every place else in the city or country. 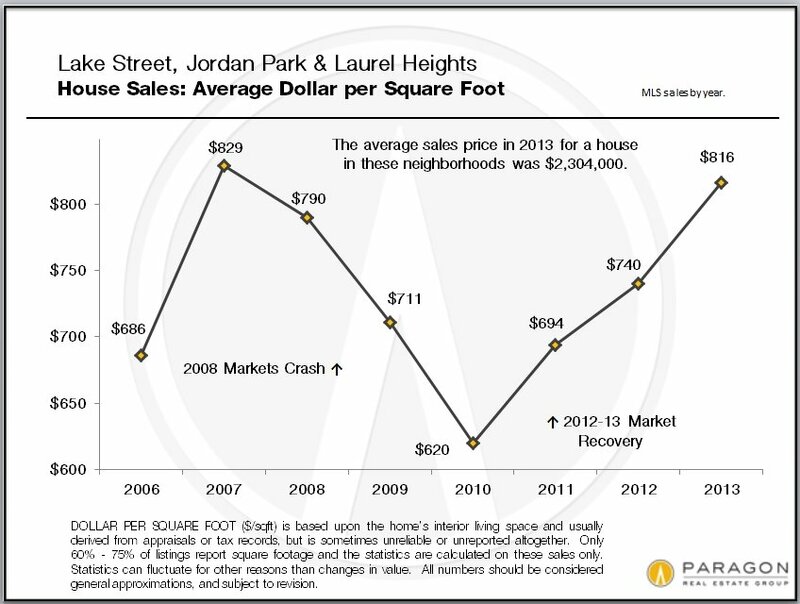 When 2012 began, prices in these districts soared, while other areas played catch up. 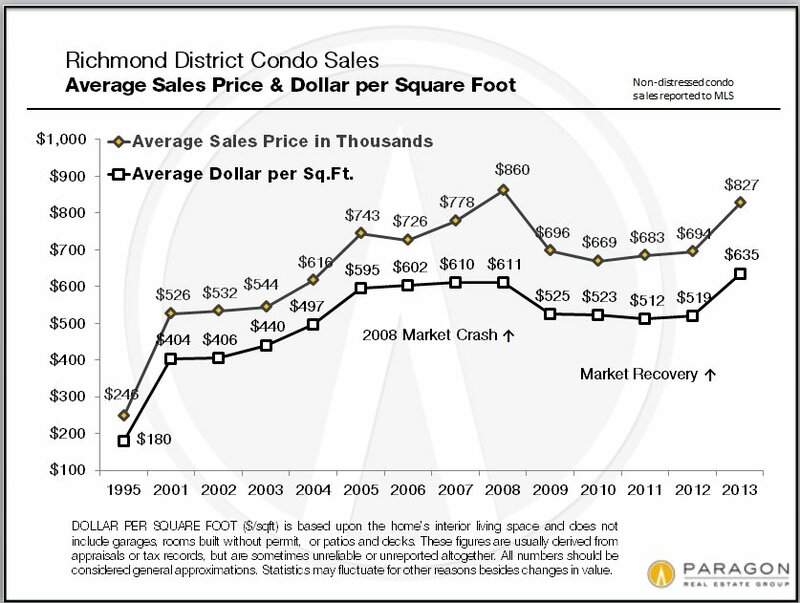 In 2013, that dynamic flipped: Appreciation rates in comparatively less expensive neighborhoods surged, while slowing in the most affluent areas. 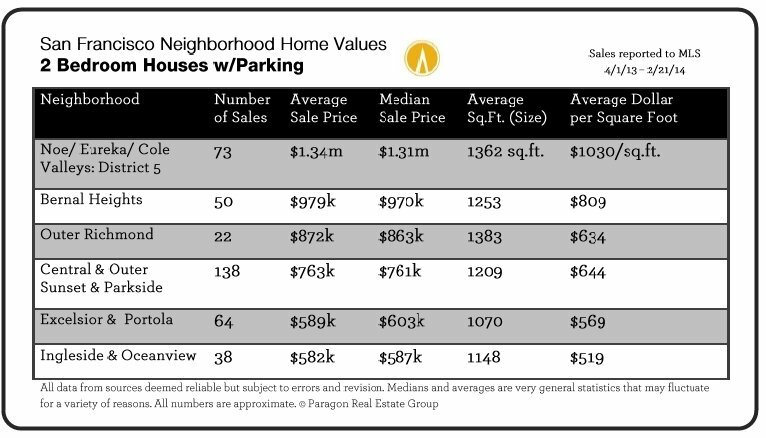 A big part of this is simple affordability: Priced out in one neighborhood (or city), buyers focused on others, similar in ambiance but less costly. Home prices there looked so good in comparison that buyers were willing to bid them up. 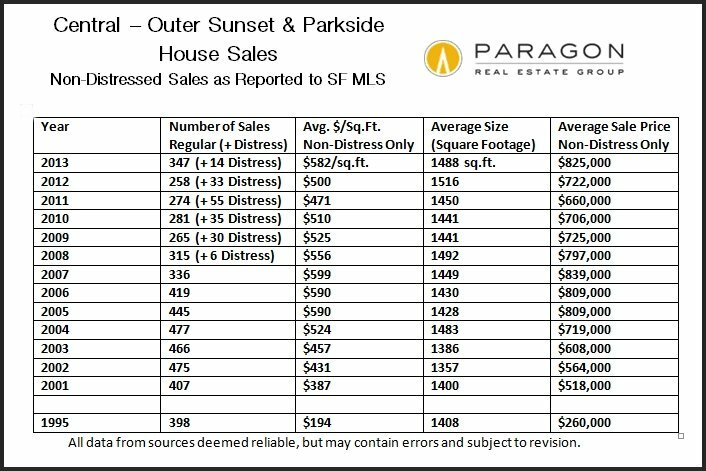 The huge decline of distressed sales in areas severely affected, such as in Bayview, has had an outsized effect on median sales prices there. Continuing gentrification, as in the Mission, and increasing “luxury” condo construction in less affluent areas have also played parts in this trend. 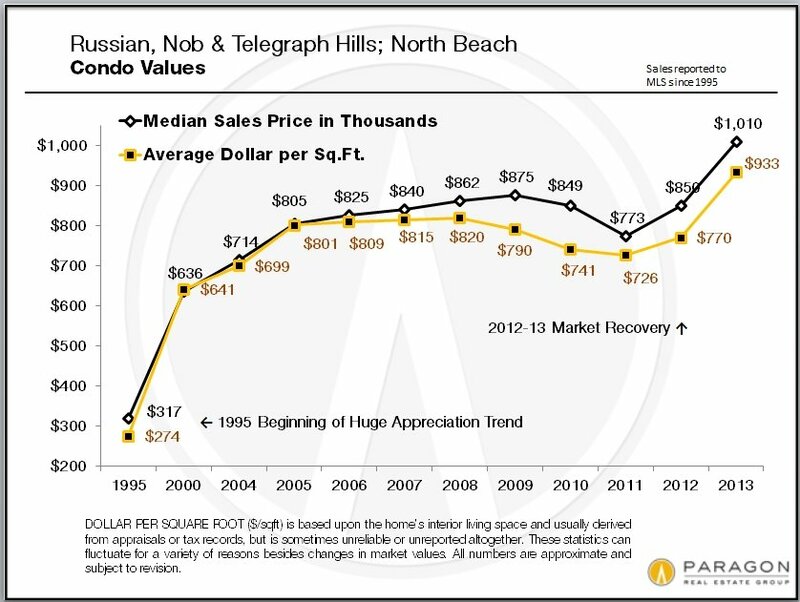 It’s not as if demand plunged in the Pacific Heights-Marina district (or Noe Valley, for that matter). 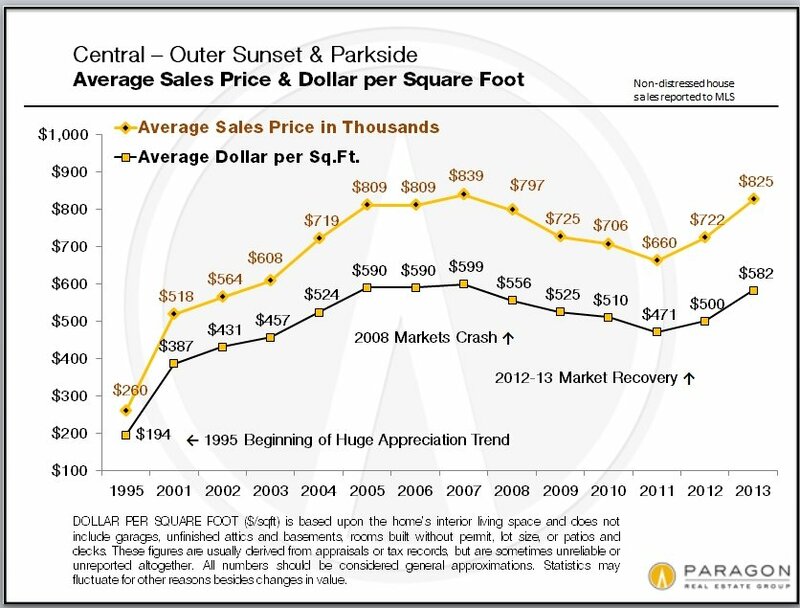 Quite the contrary: its 9% appreciation rate in 2013 translated into the city’s largest median price increase in dollar terms ($300,000). 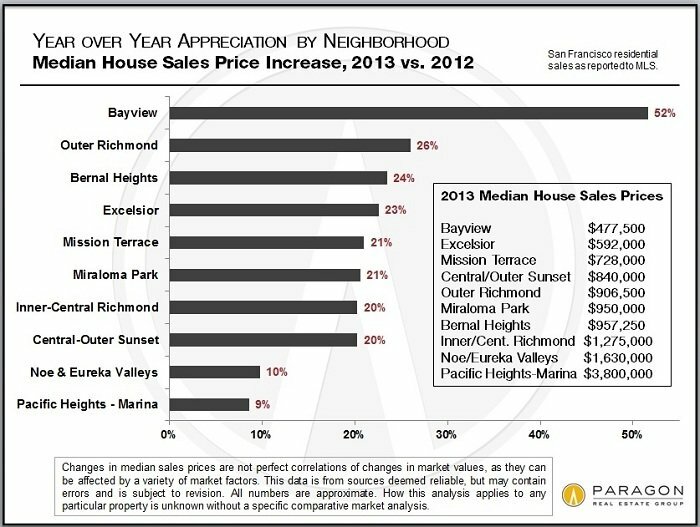 However, in the previous year, this district saw year over year median price appreciation of 25%. 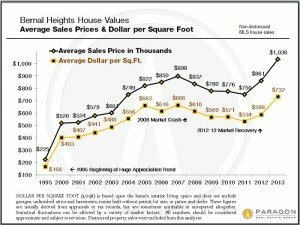 Note that median price appreciation does not perfectly correlate to changes in home values, as it can be affected by a variety of market factors. It does give an approximate sense of market trends. 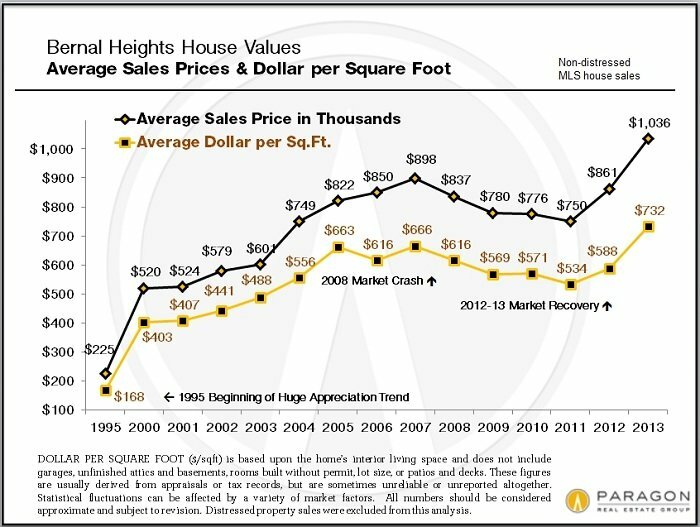 As the market turnaround began in earnest in early 2012, two trends emerged: 1) increasing percentages of sales without any previous reductions in list price, hitting a whopping 90% of sales in May 2013, and 2) sales prices exceeding asking prices by escalating percentages, hitting an incredible average of 9% over list price in June of last year. Both of these highs reflect the ferocious spring 2013 market frenzy. Since then, these statistics dropped, stabilized and have now dropped some more. One shouldn’t make too much of a month or two of data, and it must be noted that the January numbers — 81% of sales occurred before any price reductions, at an average of about 4% over list price — would signify a red hot market at any other place or time, but they are significant drops from those predominating last year. We won’t know whether it’s a seasonal blip or the beginning of a major shift until the spring selling season gets underway. 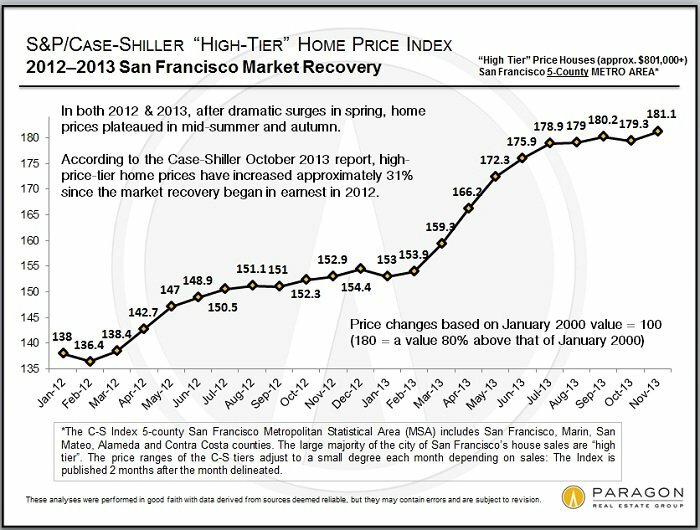 This chart is updated through November 2013, reflecting the last Index report published by Case-Shiller: It illustrates approximate Bay Area home price appreciation for higher priced homes, which San Francisco’s generally are, over the past 2 years. Spring 2012 and especially spring 2013 saw very large upswings in values, but prices then stabilized and basically plateaued since last summer began. Will this spring bring another increase in prices or has the market exhausted its appreciation momentum for now? We shall soon know. 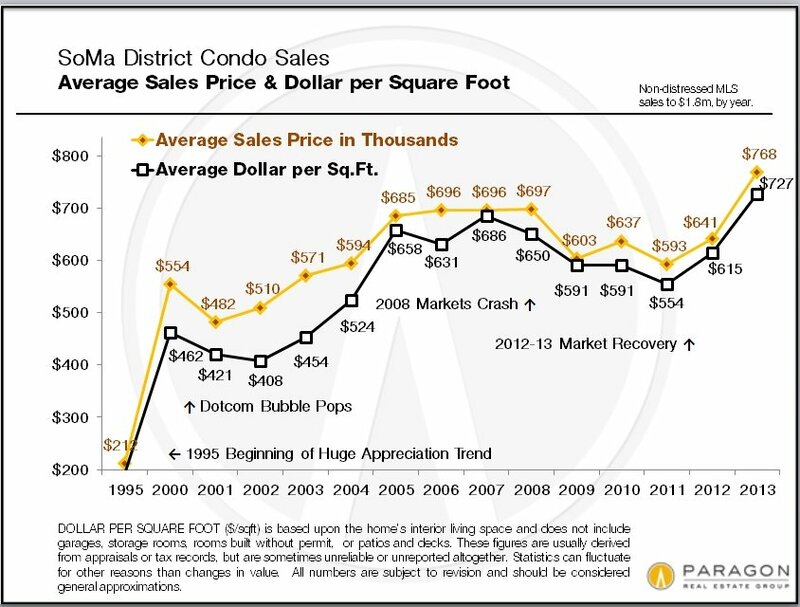 Note that chart numbers refer to January 2000 values designated as 100: 181 signifies home values 81% above that of January 2000. One thing that has not changed in the market is the very low level of homes available to purchase. 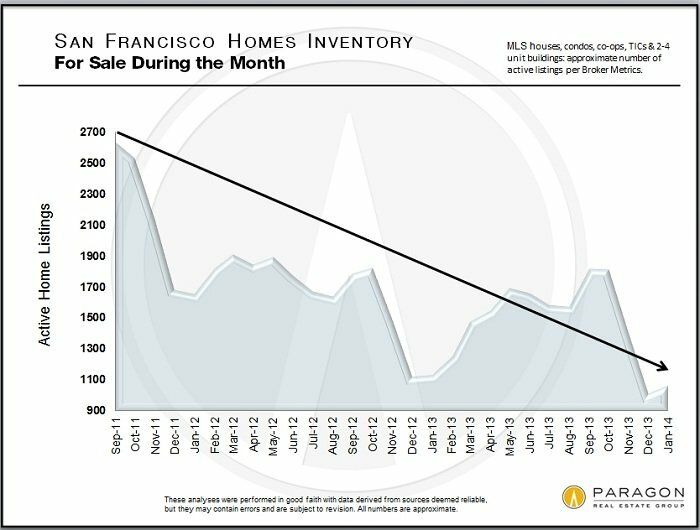 Historically, inventory usually surges in spring, declines somewhat during the summer, jumps again in autumn (September is typically the single month with the greatest number of new listings) and then plunges dramatically for the holidays and mid-winter. Agents and buyers are desperately hoping for a major surge of new inventory in the next couple months. 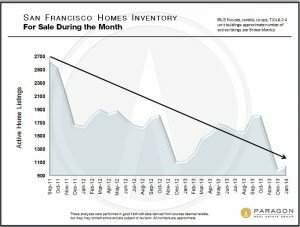 Generally speaking, low inventory puts upward pressure on prices when buyer demand is healthy.This link looks at Months Supply of Inventory. While still very low — anything under 3 months is typically considered a Sellers’ market — it is climbing. The lower the MSI, the stronger buyer demand is as compared to the supply of homes available to buy, and the more likely prices are to rise. 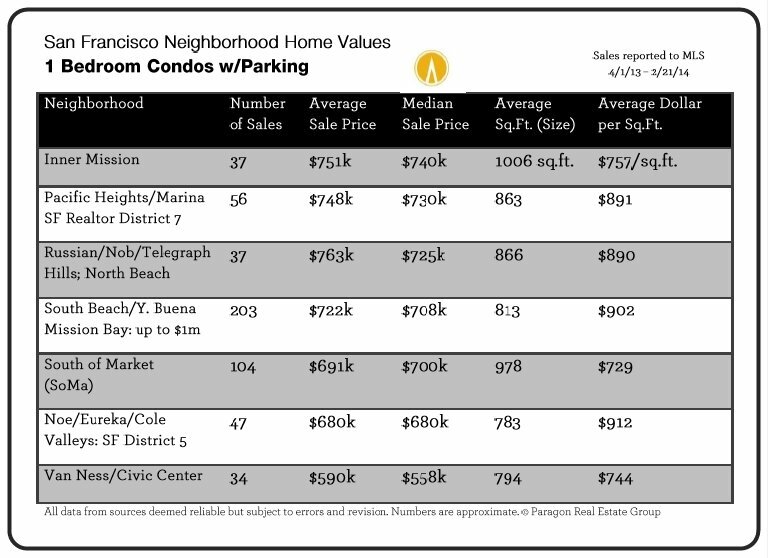 We’ve updated long-term market value charts for several dozen San Francisco neighborhoods. 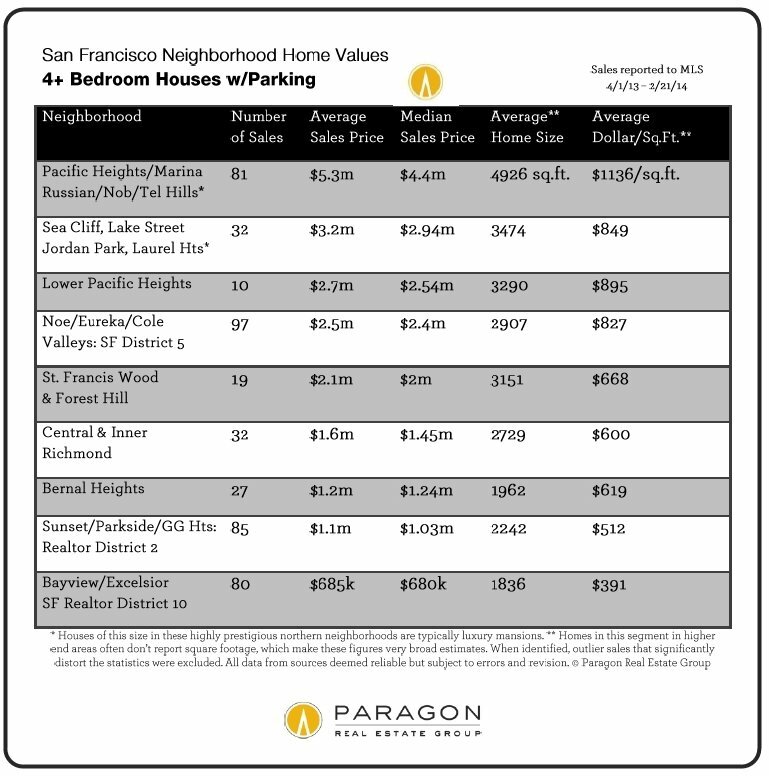 This one is for Bernal Heights, a neighborhood which experienced feverish appreciation in 2013. 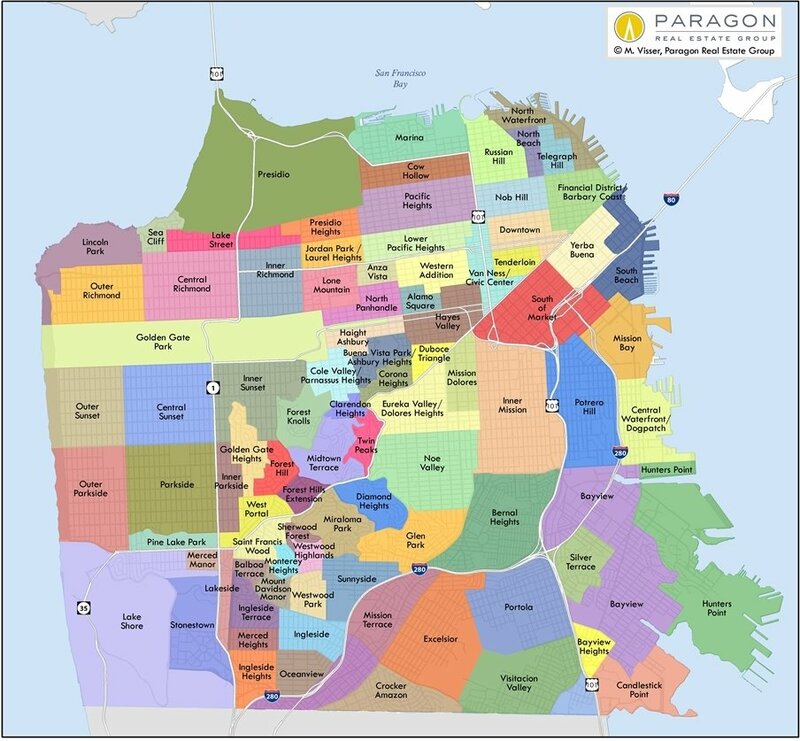 This link below goes to the webpage containing all these neighborhood charts. 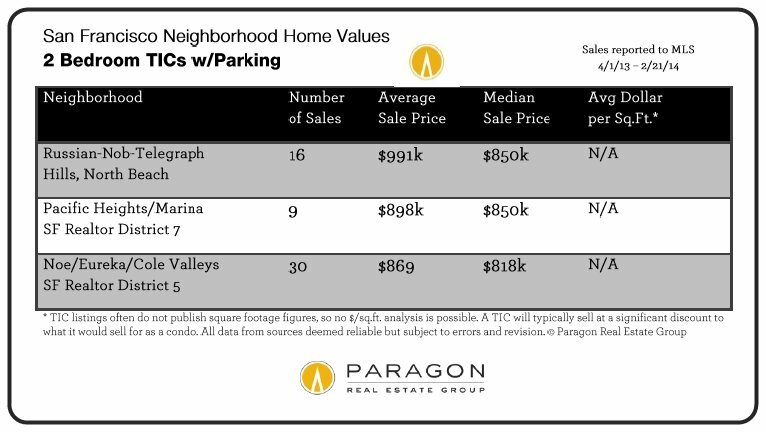 Let us know if you can’t easily find one for the neighborhood or property type you’re most interested in. Confounding “expert” predictions once again, interest rates in the first week of February fell to their lowest point in almost 3 months, though they were still about 1 percentage point above the historic lows of one year ago. 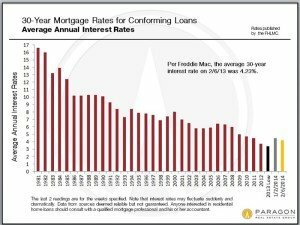 Interest rates play an enormous role in homeownership affordability, and the incredibly low rates of recent years have been a significant factor in the market recovery. 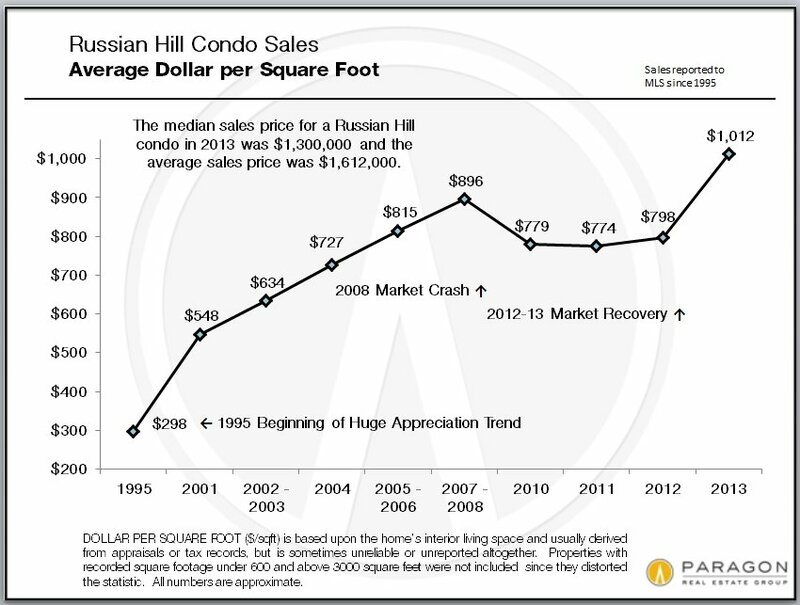 They are expected to rise, but then they were expected to jump to 6% or more in 2010 and fell dramatically instead. Where they will go this year is one of the wild cards of the real estate market. January is not a high-sales quantity month as its sales mostly reflect accepted-offer activity in December, the slowest month of the year, and monthly median price data is not that reliable as it can fluctuate without great meaningfulness. 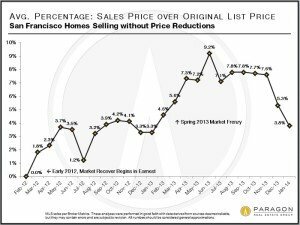 However, an odd data point came up for median sales prices in January: The median price for SF houses dropped an insignificant amount, from $938,000 in the 4th quarter of 2013 to $928,000 in January (down from a brief spike to $976,000 in the 2nd quarter). 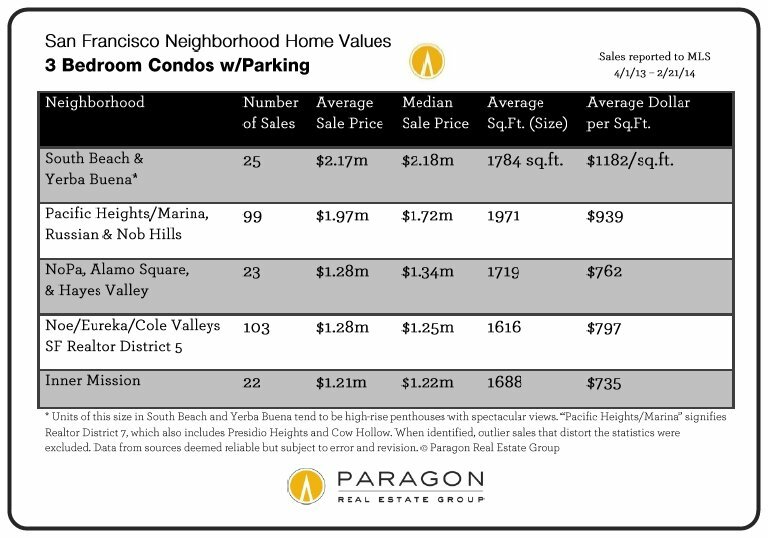 However, the median sales price for SF condos made a very big leap from $835,000 in the 4th quarter to $927,500 in January, the highest monthly condo median price ever. 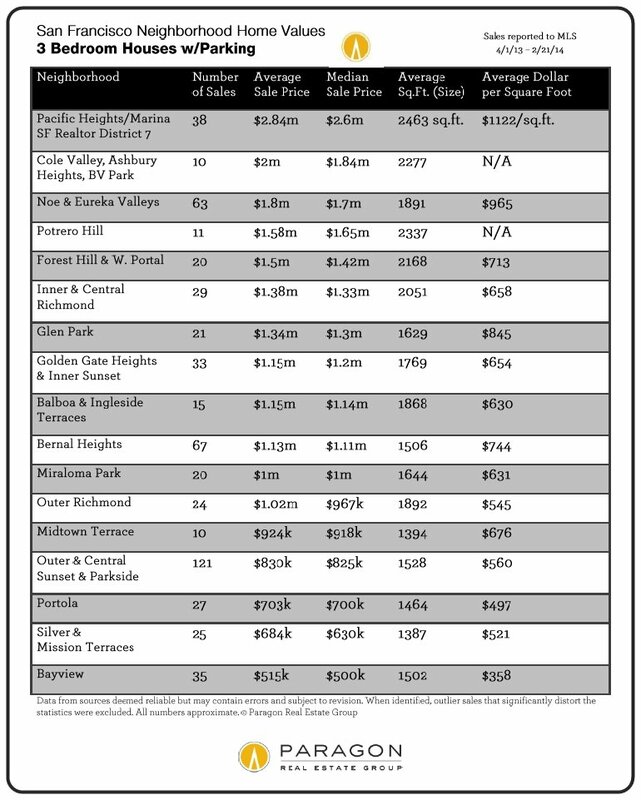 Of the 144 January condo sales reported to MLS as of 2/8/14, 45 sold for $1,200,000 or more. 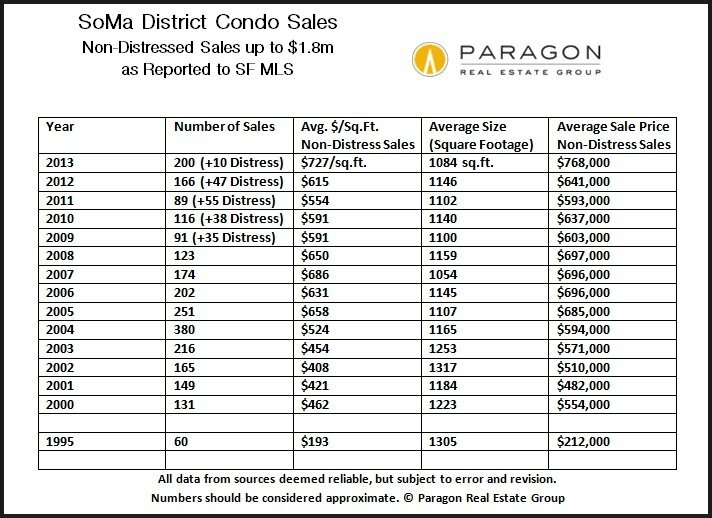 This is an unusually high percentage of high-end condo sales, especially for a January — January 2013 had 19 such transactions — and is probably just one of the anomalies we sometimes see in monthly sales data. (We much prefer longer-term data.) We’ll have to watch what happens in future months. 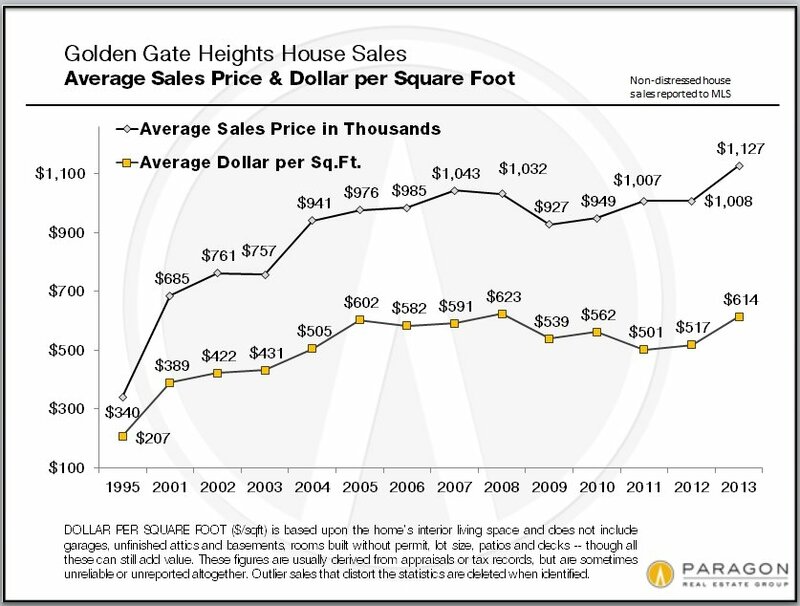 One can never take for granted exactly what is going to happen next in the San Francisco real estate market. This entry was posted in Market Conditions by admin. Bookmark the permalink.